In terms of complications, the chronograph is certainly the most widely known – and used – of them all. Then, when you pronounce the words “chiming watches“, the immediate reference goes to the minute repeater. However, one chiming complication shouldn’t be forgotten, one which is actually rather important historically and one that will immediately link to the “president watch“. Alarm watches are rare, somehow outdated – especially in our era of smartphones (but like every mechanical watch) – but also sort of fascinating. 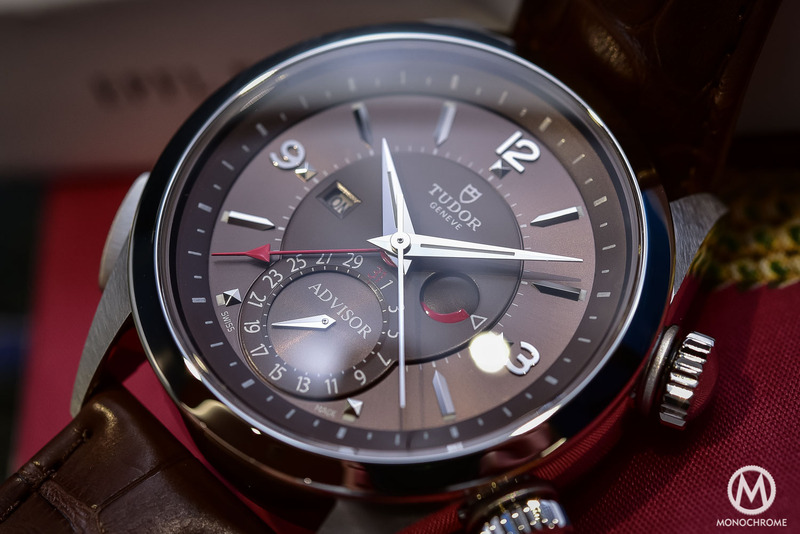 One of the very few manufacture to offer one is Tudor, and their proposition comes with a new color this year. 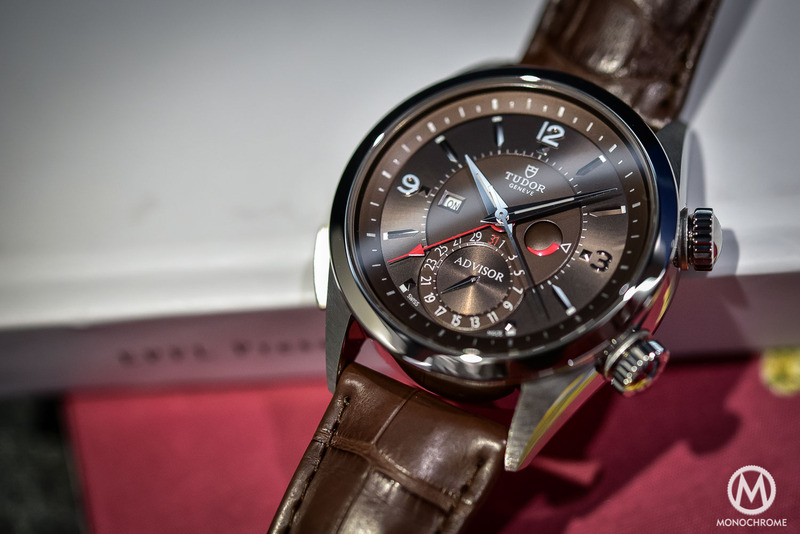 Here is the Tudor Heritage Advisor Cognac. Strange enough, we never covered this watch on Monochrome-Watches. Don’t ask why, we have no good reasons for that. It’s even more surprising, considering that the Tudor Heritage Advisor is the most complicated watch of the catalogue. This issue is about to be solved. This watch is important for 3 very good reasons. First, it is not a watch made just for the sake of it. It has a link with the brand’s history and gives echo to the first Tudor Alarm watch made in 1957. Then, it is an alarm watch, something that is rare enough to be mentioned (you can look at all the industry, mechanical alarm watches are mainly from Vulcain or Jaeger). 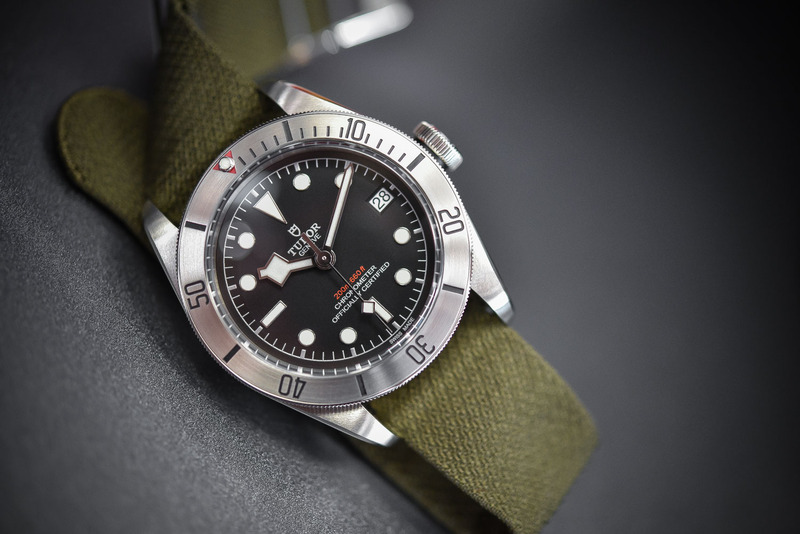 Finally, it is the first Tudor to carry something they produced in-house, and this much before the brand introduced their manufacture movement; first on the North Flag and the Pelagos and now deployed on the Black Bay. 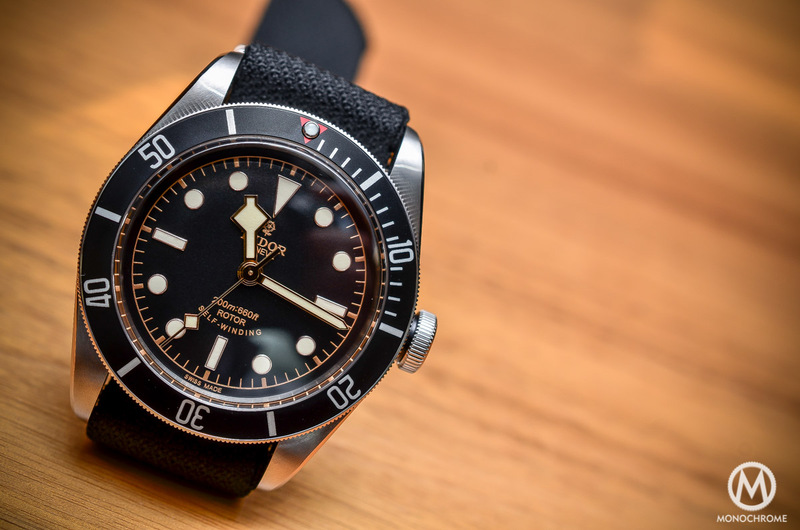 There are things to say about the Tudor Heritage Advisor, and even if it remains more niche than the dive watches from the brand, it is full of interest. As said, the Tudor Heritage Advisor is a modern reinterpretation of one of Tudor most emblematic watch – of course, less emblematic than the famous Submariners but connoisseurs know what were talking about. 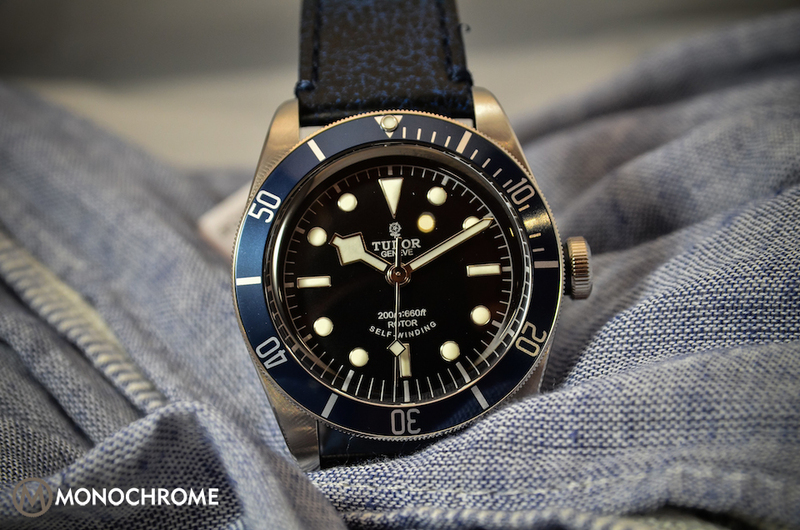 The first Tudor Advisor 7926 – see our colleagues of Watchonista for more – was introduced in 1957. At that time, alarm watches were more widely used than know, as they were the only way to carry an alarm with you (you don’t carry your nightstand alarm clock with you, don’t you?) and they were used for both waking up, remind you of an event or to time decompression steps while diving. The Tudor Advisor was amongst the numeral watches to carry this complication, which is not the case anymore nowadays. The modern Tudor Heritage Advisor retains the original shape and proportions of its case, lugs, and glass, its dauphine hands and bevelled markers, as well as the design and colour of its red alarm hand. The rest, however, has been updated, with the new version, first introduced in white and black in 2011. The Tudor Heritage Advisor is house in a 42mm case – to be compared to the 34mm of the original one – for a modern look on the wrist. Apart from the increase of size, the look of the case is extremely pleasant. The best detail to be noticed are the lugs. While they are long, their shape is both very curved to the wrist, sharp and thin. This shape first reminds of vintage watch but also gives an interesting and elegant rakish style to the watch. Then, the finish is above expectations: look at the angle between the polished and brushed surfaces. Impressive, especially knowing that this case is not steel but titanium. 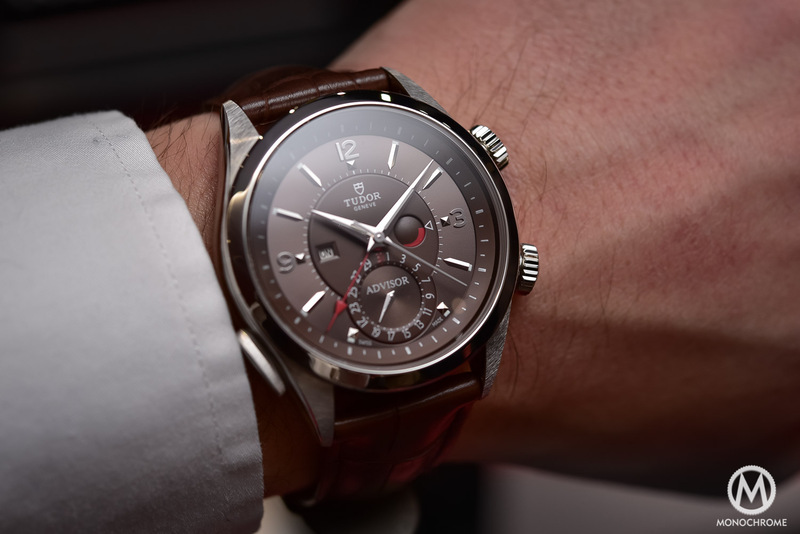 Indeed, unlike most of the watches of Tudor (to the exception of the Pelagos), the central case and caseback of the Tudor Heritage Advisor are made from grade 5 titanium, with a polished steel bezel. This choice is guided by the optimum sound quality for the alarm – and the good point is that you’ll enjoy a better resistance to scratches and a lighter case. On the wrist, this advisor is rather large but its shape perfectly embrace the wrist’s curvature. Then comes the dial, and that’s where the evolution between this modern Tudor Heritage Advisor and its ancestor is the most significant. Yes, it does retains the dauphine hands, the applied diamonds indexes, the applied numerals at 3 – 9 – 12 and the red arrow hand for the alarm but it adds several indications, practical on a daily basis. First is the date placed in a sub-dial at 6. Then are the 2 other indications, both linked to the use of the alarm. The first one is a ON / OFF window – it’s always useful to be able to disengaged to the alarm, especially when you don’t need it (and it is quite loud, believe us). The alarm is engaged or disengaged via the large pusher at 8. Then is the power reserve indicator, here not for the movement but for the alarm module, which runs on a separated barrel. The novelty this year comes from a new color option. While available in two classical colors, white or black, Tudor adds some more originality to its Heritage Advisor with a cognac dial, matched with a brown alligator strap. The color, while being rather discreet, adds some elegance to the watch, which retains its faculty to be wearable in every situation, just now with an extra (but restrained) boldness. It’s warm, pleasantly dark and colored and the combination with the overall style works very well. 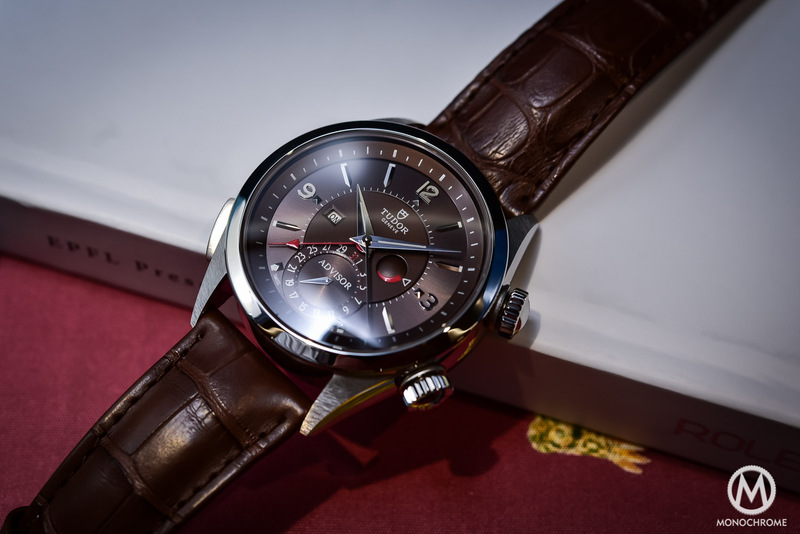 Finally, the Tudor Heritage Advisor Cognac also has to be regarded for its movement, or at least for the module that powers the alarm mechanism. 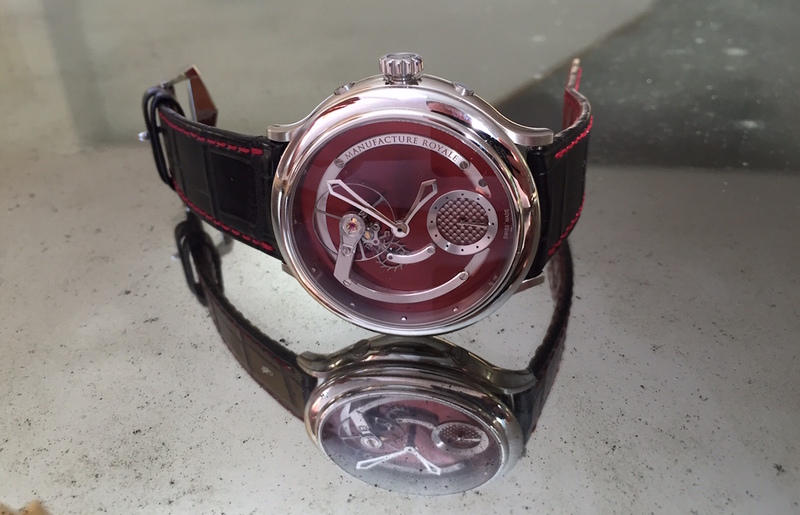 In fact, it is the first “in-house” produced movement’s part of the modern Tudor era. While the base movement is a slightly modified ETA 2892, the module on top is entirely developed, manufactured and assembled by Tudor, internally – even before the manufacture movement. The conception, with this clear display and setting (the alarm is classically set by the crown at 2), must be noticed, as well as the length (approximately 10 seconds) and loudness of the alarm function, which will certainly be a good reminder for your tasks or be a helpful to get you out of your bed. 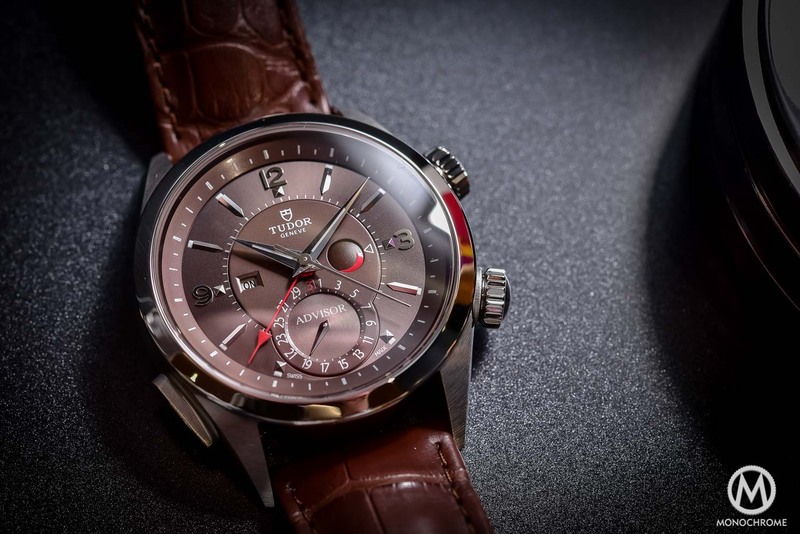 The Tudor Heritage Advisor Cognac adds a nice color to a watch that, in the tradition of the brand, combines a qualitative and practical movement, with a superbly executed case and dial. 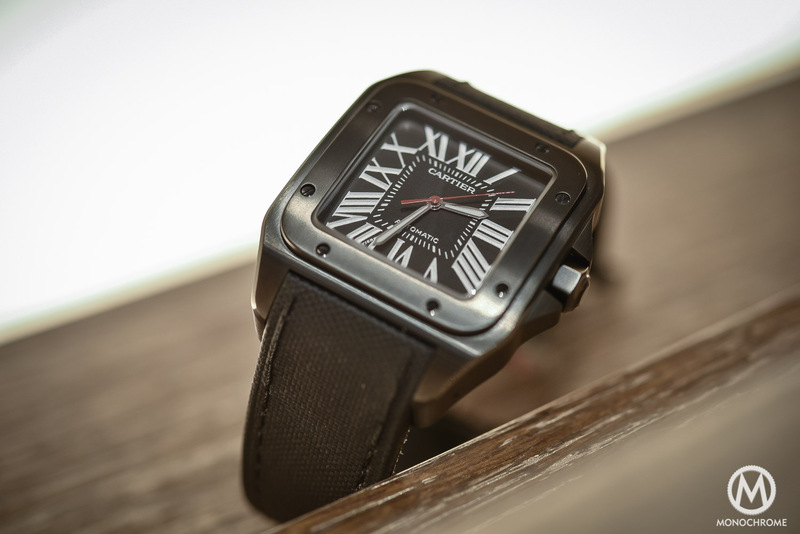 Now consider its 5,600 Swiss Francs price and the titanium case and alarm function, via in-house module. Again a great achievement from Tudor. More details on the dedicated page at tudorwatch.com. Available also on metallic bracelet. Both editions also includes an additional black silk strap. 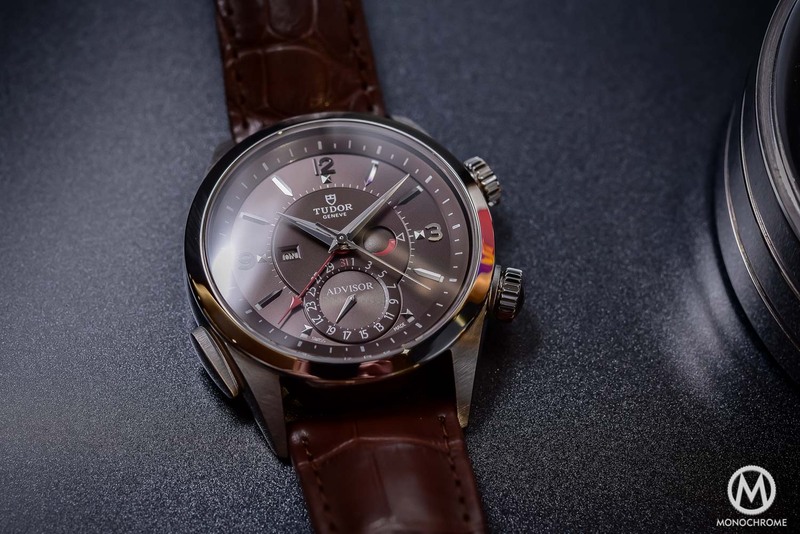 Movement: Tudor 2892 with additional alarm function mechanism developed exclusively by Tudor – Automatic – 42h power reserve – 28,800 vibrations/h – hours, minutes and seconds, date, alarm with ON / OFF indication and power reserve. Fantastic review, and beautiful pictures! You certainly have pushed this watch higher up on my “must-have” list! A good piece indeed! I think it is a handsome dial.